Nothing can substitute healthy eating and regular workouts when you want to lose weight in the long term. However there is a smart trick you can try to slim down quickly in only one week. If you are in a rush and want to slim down in a week try drinking lots of coffee. Coffee may help you lose excess water and appear slimmer in just a few days. By reducing carbs and decreasing insulin levels, you change the hormonal environment and enable your body and brain to lose weight by burning stored fat thereby improving your metabolic health at the same time. Start your day with a glass of water, avoid sugary drinks and fruit juice as they tend to add more calories, consume more fiber, protein, fats and vegetables because they are good for weight loss and reduce sodium from your diet. Hit the gym and do exercises such as squats and push-ups and remember to get a good night's sleep, to prevent weight gain. Use Skinny Piggies gummi supplements as an appetite suppressant, so you don't starve while you are dieting due to hunger pangs. Which Fiber Supplements is the Best? Need to Lose Some Weight? 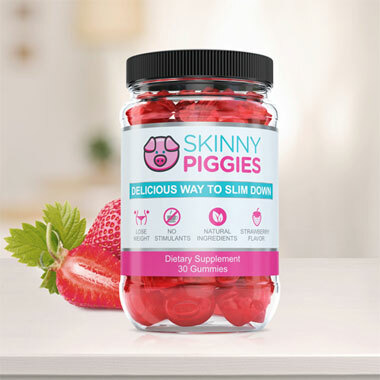 Skinny Piggies Slimming Gummies Can Help! Fed up with dull and boring diet programs? Do you feel limited when it comes to your food options? Having zero fun? Let's be frank, the majority of people don't like diet meals. It's certainly not fun eliminating foods you like, not fun being hungry, and definitely not fun trying to work out when you'd rather lay down the armchair watching the latest TV episode of Desperate Housewives. The good news is, there's an original product that can help you. Introducing: Skinny Piggies. What are Skinny Piggies? Let's give you the facts you should know first. To burn more calories than you take in, you need to ramp up the exercise or reduce how much you eat. For best results, the key is doing both. Skinny Piggies help you eat less and reduce your caloric intake which makes achieving effective weight loss easier. 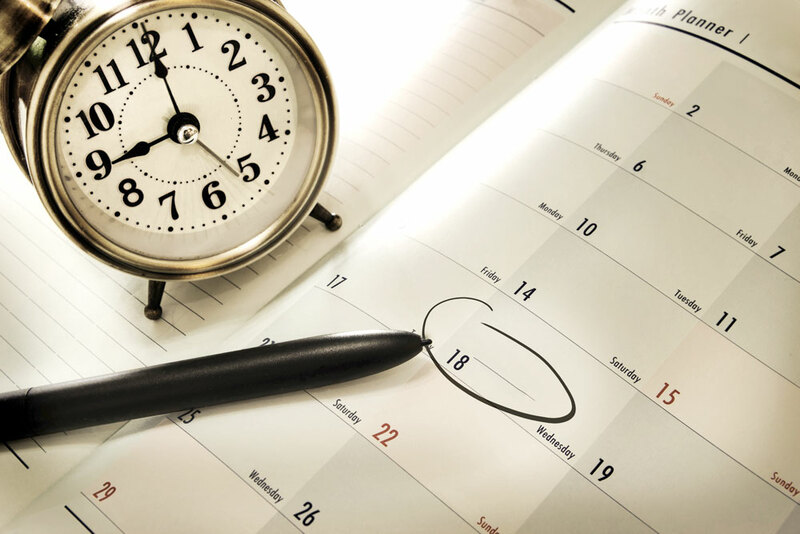 Add in an extra regular workout to help speed up the weight loss process. But hold on! This sounds good, but start cutting those calories and sweets cravings will set in, not to mention hunger that is hard to tolerate. And that's when Skinny Piggies diet gummies can help! Skinny Piggies are fun, delicious healthy treats you don't need to feel guilty about! Enjoy the delicious flavor of these slimming gummies and let them do their magic. Ok. So, what exactly are the gummies good for? 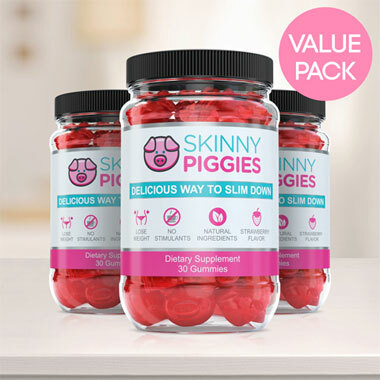 How Do Skinny Piggies Slimming Gummies Work? 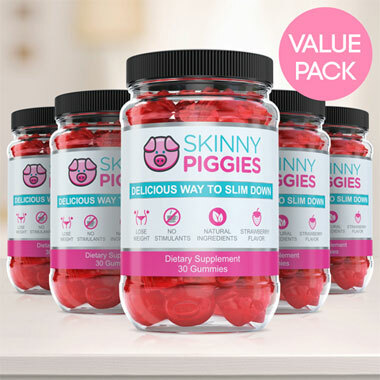 The idea of Skinny Piggies diet gummies is surprisingly straightforward. Your appetite is regulated by 2 key things: the amount of calories you consume and the feeling of food in the stomach. After a big meal, your stomach stretches by the food pressed up against the sides, that makes you feeling satisfied and no longer hungry. When you add Skinny Piggy gummies to your diet, you trick your stomach into feeling fuller, faster. Having a Skinny Piggy with a full glass of water 20-30 minutes preceding eating dinner will cause it to expand in your stomach and gives you the sense of having eaten a large meal. That means you can combat appetite and hunger, food cravings, and eat much less, without being hungry most of the time. When you eat Skinny Piggies slimming gummies prior to meals, it cover your food in a gel, and that slows down the uptake of the sugar and carbohydrates into the blood. That manages to keep your blood glucose a bit more normalized and ensures that you are in fat burning mode for many hours. It may even make your workout sessions feel easier. So you might be wondering, what's so special about Skinny Piggies versus some of the other weight loss supplements on the market? To start with, our product have zero artificial ingredients. Take a look at any fat burner and you'll see a list of chemicals. Skinny Piggies contain absolutely no artificial additives - you can pronounce all of the key ingredients. The balanced, all natural ingredients in Skinny Piggies also have extra healthy benefits such as support for healthy looking nails and hair, healthy looking skin, and anti-aging properties. Skinny Piggies have zero stimulants and no harsh chemicals. No stimulants means no running out of steam and no restrictions on when you can use them. No harsh chemicals means these gummy supplements are gentle on your stomach. Finally, what other weight loss supplement is as delicious as a strawberry flavored gummy? You will love eating these so remembering to take your health supplement will not be a stumbling block. They're simple to use and anybody can get started right off the bat. Try one and they will become a highlight of your day.